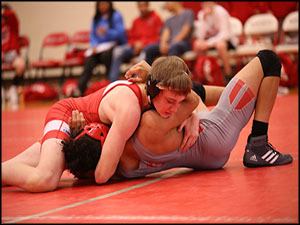 The Rocket Wrestling Team hosted Wellington on Thursday night for the last home dual of the season. This dual also marked the last time the seniors would wrestle a dual at home. The team has an outstanding senior class leading the way for them this season including Dalton Engelbert, Devin McMains, Kyle Sackett, Austin Holscher, Brexton Smith, Grant Scheer, Logan Krause, Clayton Epley, and Michael Diaz. The dual started off with the Rockets picking up a couple falls along with freshman Cade Evans winning a big match 17-12. Epley also came up big with a fall in the second period. Overall, the team took care of business and dominated the dual 55-16. Their next competition will be at the Andover Invitational on Saturday. 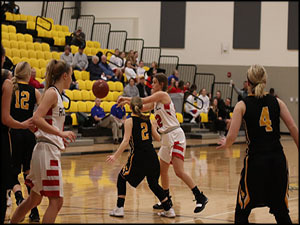 The Girls basketball team took on Garden Plain in the first round of the Haven Wildcat Classic Invitational late yesterday afternoon. It was bucket after bucket in this match up for a couple of Lady Rockets. Breckynn Myers led the way with a dominating 30 points followed by Emily Adler who had 19 points of her own. Myers and Adler combined for 87% of the offense. The Rockets are currently ranked 9th in the 4A division. The girls will try and keep their hot streak alive when they play second seeded Cheney on Friday at 6:00 pm. The Lady Cardinals are currently ranked second in Class 3A and are undefeated on the season.